DSTRYRsg: Destroyer Submission Grappling and Brazilian Jiu Jitsu: 2010 ASIAN OPEN AND THE LACK OF COVERAGE OF THE BJJ ELITE. 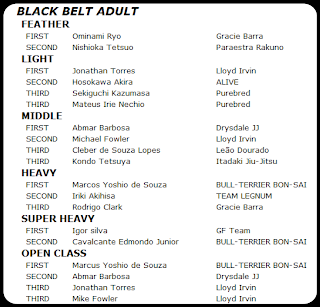 2010 ASIAN OPEN AND THE LACK OF COVERAGE OF THE BJJ ELITE. The internet is almost as vast as my knowledge of nunchuck techniques, dim mak pressure points and kung fu animal fighting styles combined. Hugely vast. So, that's why it's so disappointing that I can find multiple play-by-plays on ABC's crappy "Bachelor Pad" finale, but I can't get enough decent information on this past weekend's IBJJF Asian Open to scrap together a respectable post. This is where you say "WTF, DSTRYR!" and I nod right back reassuringly. Even Graciemag (a real magazine), has only a few paragraphs and about four photos on the tournament. 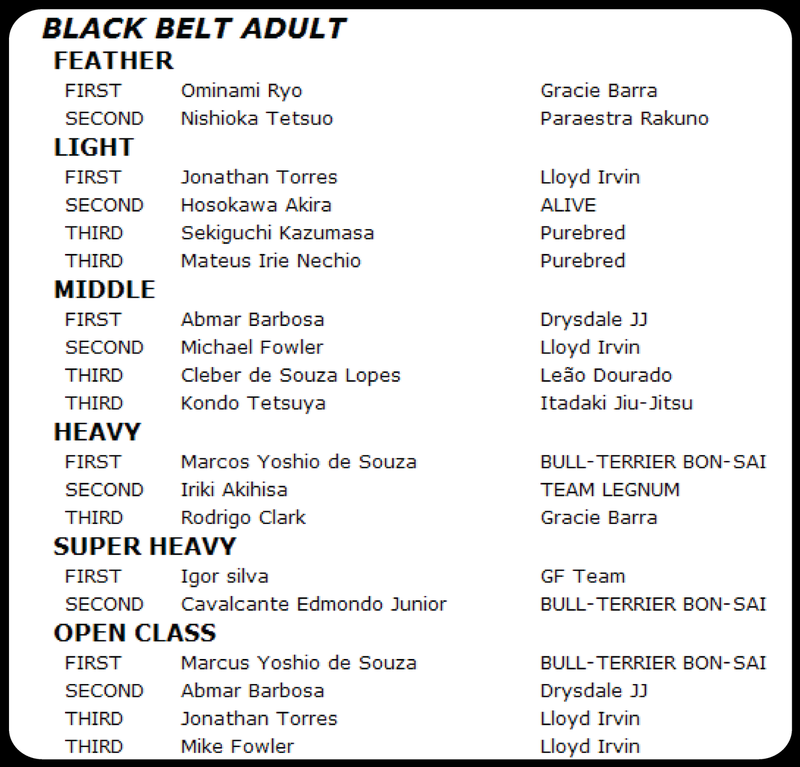 The results: Marcus Yoshio de Souza (Academia Bonsai/Bull Terrier Gym, Japan) took 1st in Black Belt Open Class (adult) by closing out the division with Abmar Barbosa. He beat JT Torres to get there. Here's a link to one of his matches (complete with Eminem soundtrack). The rest is pretty dicey. JT scored submissions in all of his matches to take 1st in the Light Weight division. Barbosa submitted Mike Fowler via crucifix to win the Middle Weight division (wish there was video on this). Pretty sad that I can get better details on Magic the Gathering and competitive eating championships than an IBJJF tournament. C'mon, jiu jitz! 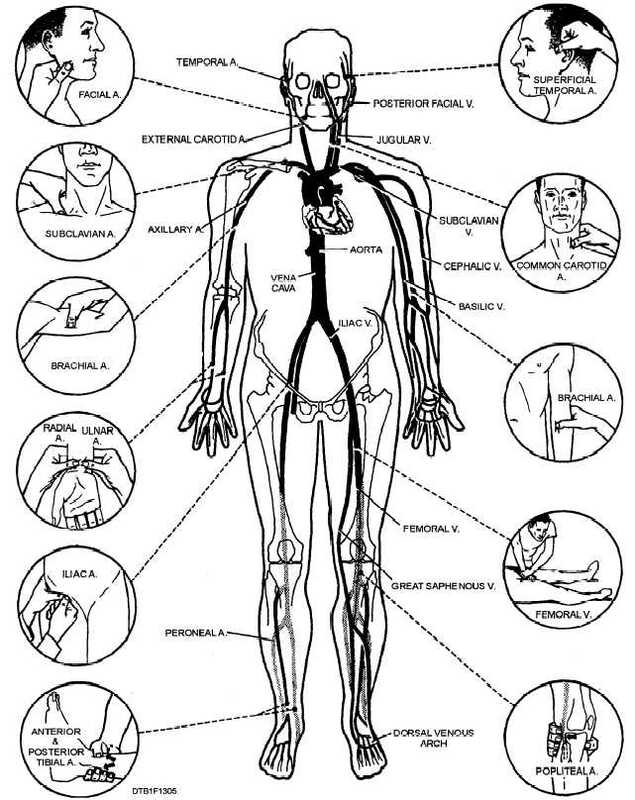 For additional (and very good) coverage on this tournament, check out our new friend, Stephen Roberto's Brazilian Jiu Jitsu Saved My Life blog. Steve's an Enson Inoue/Lloyd Irvin/Mike Fowler black belt and head instructor at Purebred Jiu Jitsu Academy, Guam (Team Purebred/Lloyd). He's got some great video up from the event. 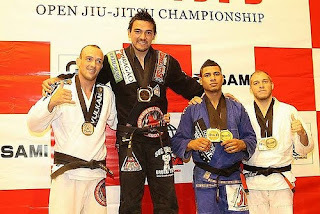 He also took gold in Senior 1 Open Class (black belt) - major props, bro! Note: Pablo Silva took gold in Light Feather division (not indicated in official results).